Join presenters Kyle Houchens and Uday Honnalagere for an informative and entertaining technical demonstration of MecSoft’s newest product - Rhino3DPRINT for Rhino 5. 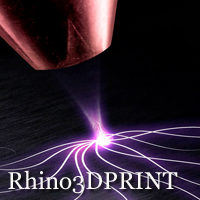 They will show you how to use Rhino in conjunction with Rhino3DPRINT to prepare your model for 3D printing. The webinar will focus on Rhino’s 3D modeling commands and powerful file translation combined with Rhino3DPRINT's tools to prepare and process the mesh for successful 3D printing. Anybody who is interested in getting their 3D data prepared and ready for effective and optimized 3D printing. It does not matter if you already have a modeling tool– you will still find this combination of products a powerful addition to your toolset when it comes to creating and readying data for 3D printing. Presentation will take approximately 1 hour and Q&A following the session. Presentation will be recorded. I have class at that time. Will this information be posted so it can be accessed at a later time? The recording will be posted by January 30. 2015. So if you can not attend, you do not need to sign up for the live webinar. Just check these web site on Friday.